This armed adversary inflicts numerous status ailments and can heal itself! Once the number above it reaches 0, it'll hit you with poison. 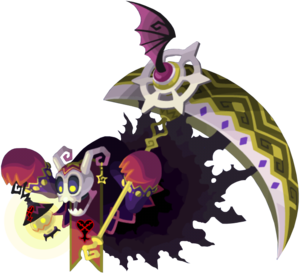 The Ferry Reaper is a Heartless that appears in Kingdom Hearts Union χ and acts as the second boss of Agrabah. This page was last edited on 3 April 2019, at 17:22.